Many of the plastics we use every day take between 450 and 1,000 years to decompose. It is believed that approximately 60% of plastics ever manufactured still exist on the planet in landfill sites and in the natural environment. And now, highlighted by the dramatic series finale of Blue Planet 2, we have an unprecedented awareness of the serious impact our plastic waste has on the planet. While we all agree that reducing our use of plastics is the most effective and desirable way to reduce landfill waste, plastic remains vital to many commercial and industrial operations. Recycling reduces landfill waste and reduces greenhouse gas emissions, yet currently only around 8% of our global plastics are reprocessed; despite the fact that over 100 types of plastic can be recycled in specialist plants. To encourage recycling, the EU has pledged to phase out all non-recyclable plastics by 2030. Recycling reduces your carbon footprint and decrease the amount of plastic sent to landfill. Increasing your green credentials demonstrates a commitment to environmental sustainability, helping to promote an ethical brand image that can help businesses attract and win customers. Evidence of recycling is also essential for complying with legislation if your business is legally obliged to recover and recycle a specified percentage under the Producer Responsibility Obligations (Packaging Waste) Regulations 2007. What you may not know is that recycling is not only an ethical choice, but can also be a lucrative strategy for converting waste plastic into a regular revenue stream. As accumulated waste materials can quickly create a health and safety hazard, many organisations simply pay to have their waste collected for convenience; without ever knowing how their waste is disposed of. However, many plastics can be recycled into raw material form and sold to the global manufacturing industry. If you regularly generate high volumes of industrial plastic bi-products you could be capitalising on the scrap value of recycled plastic by selling your waste. How Easy Is It To Sell Plastic Waste? You can sell plastic waste for recycling with a little organisation, storage space and staff participation. Each type of plastic has a market price per tonne known as a rebate value. You can sell mixed plastics, but by separating clean and contaminated plastics and sorting these by material and colour, you can increase the value of your scrap considerably. Compacting plastics into industry standard sized milling bales and using specialist containers can reduce the amount of storage space needed for recycling and simplifies transportation, thus further increasing revenue. A reputable recycling partner, such as Recycled UK Ltd, can offer advice on how to create a practical waste management policy that works for your business and helps you to achieve the best rebate rates for your scrap. How Much Is Your Waste Plastic Worth? 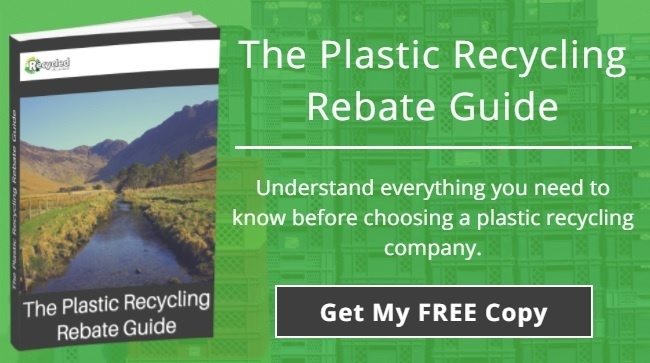 Download our FREE Plastic Recycling Rebate Guide to find out how much you could receive for your waste plastic. Our straightforward guide explains everything you need to know about plastic recycling and how to increase the value of your scrap plastic. When it comes to taking responsibility for waste there is no ethical comparison between landfill and recycling. By working with a recycling partner, you can turn plastic bi-products into a valuable commodity and lower your carbon footprint – a winning combination for your business and for the planet.